A Look at books I am anxiously awaiting! YES, I am posting my review again because this book is JUST THAT Awesome! Plus I originally posted it two weeks ago and release day is TODAY! An Amish Cradle is another wonderful collection of fabulous stories by four amazing authors! I LOVE THESE BOOKS SO MUCH! I have every single one – yes, you read that right – every single one of the anthologies in this series of books. It started as a bit of a fluke. I picked up the An Amish Christmas at our local used book store one year. And then I signed up to review one with BookLook bloggers and the rest, as they say, is history. As I am a notorious book collector, I had to have them ALL! I enjoy SO MUCH these extra stories put together by several authors whom I just LOVE! And I especially LOVE IT when one of them is kind of a BONUS story! As far as I can tell (I haven’t read everything Kathleen Fuller or Beth Wiseman has written), Amy Clipston’s is the only story in this collection that fits that description but that’s enough for me! I have not rewritten the review below but I have added little thing in here and there. Down Syndrome has got to be one of the toughest subjects to write about and I applaud Beth Wiseman for, not only doing it, but doing it well! It’s always difficult to understand God’s will in these situations and I love how Beth shows us that – Amish or not – these parents have to deal with the situation as a mother and father. Bravo Beth for showing that it’s not easy for the Amish just because of their faith. OK… I admit it. This is my favorite story in the book! And that’s really saying something because they’re all so fantastic! Carolyn and her husband Joshua are two of my favorite characters from Amy’s Hearts of the Lancaster Grand Hotel series. I don’t know how Amy did her research for a single mom but she certainly nails it right on the head! And anyone who says that Amy went overboard with Carolyn’s emotions in this novella can not have ever been a single mother. This story is PERFECT! Bravo Amy! And THANK YOU for giving us this extra little bonus in what is a fantastic series! I refuse to ruin any of this story for you. It’s just too good to miss! This is one of those stories that also shows how the plain folk deal with tough situations things in much the same way as we all do. Although it does come in handy that most Amish have a very strong faith! I LOVE that stories with older main characters are becoming more popular! I think, far too often, people forget that interesting things still happen to those of us over the age of 30. Vannetta does such an exceptional job of writing this story! Instead of the anxiety over not being a good mother or not knowing what she’s doing – Etta has worries of a much more seasoned wife – and yet – Vannetta does not minimalize the issues a young mother would deal with, she simply shows an aspect of life that not many other authors think to. I hope to see many more stories like this! BRAVO Vannetta! GREAT writing! BRAVO to all four authors! I can hardly wait for the next one! If you hop over to Facebook KATHLEEN FULLER is running a giveaway. AMY CLIPSTON is advertising her next book signing – DON’T miss that! VANNETTA CHAPMAN has posted a great video that ties in with one of her upcoming stories. And BETH WISEMAN has some great discussions about her travels, how to find God in our writing and the ever-popular Amish Mud Sales that will be going on soon! VANNETTA CHAPMAN is hosting several giveaways on her website so don’t miss those! AMY CLIPSTON is running a contest to win two of her other titles so don’t miss that! And a member of Any’s street team is hosting a Giveaway too – ZAC WEIKAL! 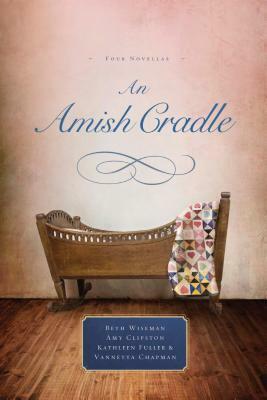 DON’T MISS An Amish Cradle by Beth Wiseman, Amy Clipston, Kathleen Fuller and Vannetta Chapman! – CLICK TO TWEET! Once again, Beth Wiseman brings us a wonderful story of love and real life! – CLICK TO TWEET! Amy Clipston has gifted us with a wonderful BONUS story about two favorite characters! – CLICK TO TWEET! Kathleen Fuller certainly doesn’t shy away from serious subjects! – CLICK TO TWEET! Vannetta Chapman is a masterful storyteller – no matter the plot! – CLICK TO TWEET! Ruth Anne Zook is excited that she and her best friend are due with their children the same week. But when Ruth Anne’s baby is born with Down Syndrome, she and her husband struggle to understand God’s plan. Carolyn and her husband Joshua are thrilled to be pregnant with their first child. A teenager when she had her son Benjamin, Carolyn still feels obligated to work to secure Ben’s future, even though Josh adopted Ben. She struggles to realize that Josh will love and protect both of their children equally. Ellie’s mother loves to meddle in her personal life—especially now that Ellie’s pregnant. Since Ellie is blind, her mother worries that she won’t be able to handle the baby. When Ellie gives birth to twins, her mother insists on moving in. Just as everyone reaches the breaking point, a miracle draws them closer to each other and to God. At 42, Etta thought her time of having children was over, but she’s pregnant again. She goes into labor during a blizzard, and complications with the delivery raise fear. Etta struggles to accept Gotte’s wille for the baby and her son, David, who moved away two years earlier in search of what he would do with his life. You can find more information and/or buy the book from these popular sites. I was blessed to receive a review copy of this book in exchange for an honest review. All opinions are entirely my own. Disclaimer: I have no control over the ads you may see below. I am sorry if any of the content is inappropriate. < Previous Your chance to WIN “Beyond All Dreams” by Elizabeth Camden AND a Kindle Fire! Would you like to get monthly updates about my books, events and promos delivered right to your inbox! Sign up for my Newsletter by clicking the link below! Round 2. It's off to Parrot Mountain we go, and it's clearly going to be a wet one. Between the weather and the traffic, it's been a bit more difficult than we'd imagined it could be to get Sam there for his birthday. . Fingers crossed. ©JCMorrows 2013 - 2015 Unauthorized use and/or duplication of this material without express and written permission from this blog’s author and/or owner is strictly prohibited. Excerpts and links may be used, provided that full and clear credit is given to JC Morrows (JCMorrows) with appropriate and specific direction to the original content.